London (AP) – After 18 games and more than four months, Manchester City’s record winning run in the Premier League is finally over. That was not the only bad news for Pep Guardiola on Sunday. During the 0-0 draw at Crystal Palace, the City manager saw Gabriel Jesus sustain a leg injury that could rule out the striker for up to two months and then star midfielder Kevin De Bruyne get carried off on a stretcher. It remains to be seen for how long the favorite for English soccer’s Player of the Year award is sidelined. 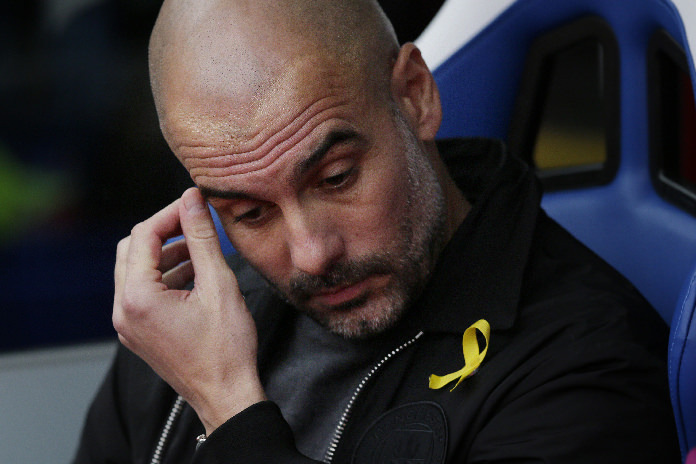 But Guardiola can at least console himself that his team head into 2018 with a 14-point lead with 17 games remaining. Finishing the season unbeaten, emulating Arsenal’s “Invincibles” of 2003-04, is also still a possibility. Thirteen years later, Wenger is still in the Premier League and, like Guardiola, still breaking records. The Frenchman took charge of his 811th match in the Premier League — a record in a division that was inaugurated in 1992 — when Arsenal visited West Brom in the final game of 2017, and saw his team concede in the 89th minute from a disputed penalty to draw 1-1. A 19th straight victory for City would have matched the record winning streak in Europe’s top five leagues, set by Guardiola’s Bayern Munich in the 2013-14 season. Yet the leaders turned in one of their sloppiest displays of the season — even De Bruyne’s imperious passing radar was off — and needed a penalty save from Ederson Moraes off Luka Milivojevic in injury time to preserve their undefeated start. That was part of a strange end to the match. Moments after the penalty — contentiously awarded after Wilfried Zaha fell easily under a challenge from Raheem Sterling — came a robust foul on De Bruyne by Jason Puncheon as City launched a counterattack. While both players received treatment, before being simultaneously carried off the field on stretchers, Guardiola took a seat next to Hodgson in Palace’s dug-out and the managers chatted. It was the first time City dropped points since a 1-1 draw at home to Everton on Aug. 21. Soon after City’s game, and hours before Arsenal kicked off, Guardiola said there would be “internal meetings” over whether the club would make a bid for Alexis Sanchez in light of the injury to Jesus. City failed in a late bid for Sanchez on the final day of the summer transfer window. His display at West Brom would have impressed Guardiola. The Chile forward looked Arsenal’s most likely route to a goal before he curled in a free kick that deflected off the leg of James McClean, who turned his back in the defensive wall, and ricocheted in after 83 minutes. Arsenal were on course to move within a point of fourth-place Liverpool, only for the controversially awarded penalty that left Wenger furious on the touchline. Rodriguez sidefooted his spot kick down the middle to earn West Brom a point. Wenger said the awarding of the penalty was “difficult to accept,” and complained about the standard of refereeing. He also criticized the scheduling of matches over Christmas that left Arsenal with games against Crystal Palace and West Brom in a span of less than 72 hours. West Brom had two more days’ rest than Arsenal from their last game.